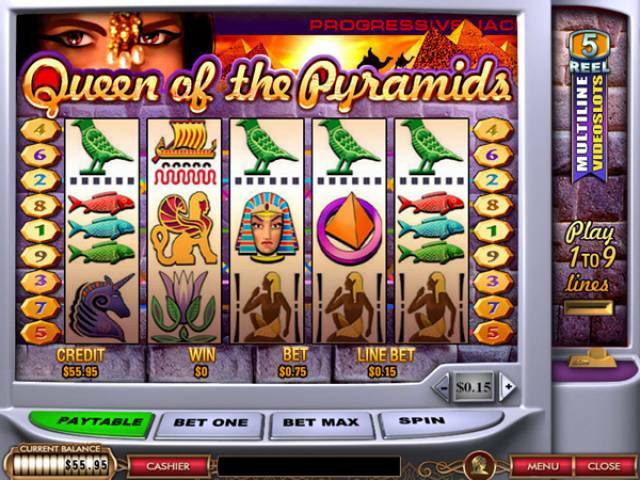 Queen of the Pyramids is a new (Oct2005) 5 reel progressive slot machine which will be available at most Playtech casinos. It has a lovely Egyptian theme about it and some pretty graphics with heiroglyphics, symbols and imagery all depicting typical Egyptian themes. This 5 reel slot machine has 9 paylines and a whopping 38 possible winning combinations. The Tut symbol is also wild which helps, and there is a bonus round which you get activated if you hit 3 unicorns on a payline. Also getting the scatter symbols will yield you free spin rounds. Get 5 scatter symbols and you'll get 100 free spins!! Overall this is quite an entertaining slot machine, although there are other more engaging slot games out there, Queen of the Pyramids will still keep you entertained for some time! The pharaoh symbol is a wild symbol – meaning it stands for any other symbol, like a joker in card games. The exceptions are the bonus and scatter symbols, which the wild symbol does not replace. One of the possible wins in this game is the progressive Jackpot, built up by all the casinos that offer the game. A small percentage of each bet, by every person playing this game in each of many online casinos, is added to a common pot. When a player gets the right result, that player wins the entire Jackpot (in some games you can also win part of it). If a Jackpot is being discontinued (a game is closed and removed from the casino client), you will be notified of it by the casino of Queen of the Pyramids.